A patient became sick with Legionnaires' disease in August after officials found the bacteria that causes the disease in the hospital's water system, according to a spokeswoman. GRAMERCY — A patient at Mount Sinai Beth Israel Hospital came down with Legionnaires' disease last month and the bacteria that causes the deadly respiratory illness was found in several areas of the hospital, according to a hospital spokeswoman. During routine tests in August, the hospital's water system tested positive for specimens of Legionella pneumophila — the bacteria connected to the Legionnaires' disease that killed 16 people and sickened 133 during an outbreak in the city last summer, according to spokeswoman Lucia Lee. After the bacteria was found, doctors diagnosed one patient with Legionnaires' and coordinated with authorities for treatment but more information on the patient’s age, gender and condition were not immediately available, Lee said. 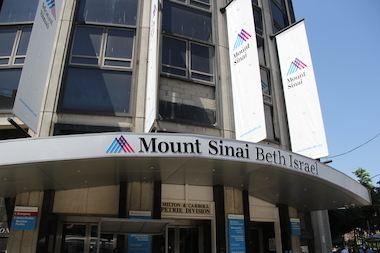 “Last month, during routine testing of our water systems at Mount Sinai Beth Israel, tests returned positive for Legionella bacteria in some areas of the hospital,” Lee said in a statement. "The hospital remains fully open and safe for patients and visitors." Since then, the hospital has implemented "water restrictions" to keep the disease at bay, including the installation of special filters on sinks, shower heads and ice machines, Lee said. ► FAQ: What is Legionnaires' Disease? Legionnaires' disease, also called Legionellosis, is a form of pneumonia caused by the inhalation of the bacteria. The illness causes coughing, shortness of breath, fever and headaches, and can be fatal. People at particular risk are those who are middle-aged or older — especially cigarette smokers — people with chronic lung disease or weakened immune systems, according to the city's Department of Health. The disease was first discovered in 1976 when an outbreak of the illness sickened hundreds and killed 34 at a convention of the American Legion in Philadelphia. The source of the outbreak last summer was tracked to a cooling tower in The Bronx. The city's Department of Health deferred questions to the State Department of Health, which did not immediately respond to request for comment.